I read this article and found it very interesting, thought it might be something for you. The article is called 2.5 Years On, Swachh Bharat Mission’s Claims Remain Unverified and is located at https://archive.indiaspend.com/cover-story/2-5-years-on-swachh-bharat-missions-claims-remain-unverified-93558. Although Swachh Bharat Abhiyan (Clean India Mission) has sent India on a toilet construction spree, 51.6% of households across the country did not use an improved sanitation facility–a system that separates human excreta from human contact–between January 2015 and December 2016. Household toilet availability has improved from 41.93% in 2014 to 63.98% in 2017, and Himachal Pradesh, Sikkim and Kerala have achieved 100% open defecation-free (ODF) status, data from the Ministry of Drinking Water and Sanitation show (as of May 22, 2017). However, almost all the progress reported by the ministry has been through no third-party verification, due to which the World Bank is holding off a $1.5 billion loan it had promised. As the BJP government completes three years in office this week, IndiaSpend is analysing five of its key electoral promises–on employment, Swachh Bharat, roads, access to electricity and terrorism. In the second part today, we look at how the status of the Swachh Bharat Abhiyan. While Swachh Bharat Mission-Gramin guidelines clearly envisage a yearly, country-wide, independent third-party assessment of the sanitation status of rural areas, there has been no independent monitoring so far. The World Bank, which had promised a loan of $1.5 billion for Swachh Bharat Mission-Gramin– the rural arm of the mission, has not released the first instalment which was due in July 2016 because India has not fulfilled the condition of conducting and announcing results of an independent verification survey, The Economic Times reported in January 2017. Since 2014, 40 million household latrines have been constructed. Between May 1 and May 21, 2017, 489,710 individual household latrines were constructed across the country, data accessed on May 22, 2017 from the Swachh Bharat Mission-Gramin website show. That’s an average of nearly 25,000 toilets constructed per day. Gram panchayats have self-declared 193,081 villages to be ODF, but 53.9% of these have not been verified, according to the Ministry of Drinking Water and Sanitation, which is responsible for Swachh Bharat Mission-Gramin, which accounts for 85% of Swachh Bharat Mission’s budget. (Data accessed on May 22, 2017). Villages are considered ‘open defecation-free’ when no faeces are openly visible and every household and public/community institution uses safe technology to dispose of faeces in such a way that there is no contamination of surface soil, groundwater or surface water; excreta is inaccessible to flies or animals, with no manual handling of fresh excreta; and there are no odour and unsightly conditions. Usually, an ‘ODF village’ declaration is made by the village or gram panchayat. The state government is supposed to carry out a first verification within three months, and a second verification around six months after the self-declaration. As of 2016, 36.7% of rural households and 70.3% of urban households–48.4% of households overall–used improved sanitation facility, data from the National Family Health Survey 4, which was conducted between January 2015 and December 2016, show. A majority, 51.6%, did not. Improved sanitation facility means having a system that separates human excreta from human contact which includes piped sewer system, septic tank, pit latrine, etc. About 47% of those who defecated in the open said they did so because it was pleasant, convenient and comfortable, a 2014 survey of 3,200 households in five states with the highest rates of open defecation found. Among households that had built a latrine, 40% had at least one family member defecating in the open, the study conducted by the Research Institute for Compassionate Economics, a non-profit research institution, found. “Programmes must concentrate on behaviour change and promoting latrine use, rather than building latrines. Although building latrines could be part of a successful policy package, little will be accomplished by planning to build latrines that will go unused,” the authors noted. Indians’ preference for open defecation has to do with the practice of untouchability and beliefs about purity, according to this 2017 study by the same institute. Through quantitative and qualitative studies, they found people considered having and using pit latrines impure and polluting. “Open defecation, in contrast, is seen as promoting purity and strength, particularly by men, who typically decide how money is spent in rural households,” the study found. Since the focus of Swachh Bharat Mission-Gramin is on behaviour change, the guidelines require that 8% of the funds be allocated for information, education and communication (IEC) activities. During the 2016-17 financial year, 1% of the total expenditure had been made on IEC up to January 2017, according to Accountability Initiative’s budget brief. In contrast, 98% of the funds had been spent on construction of toilets in individual households. Duplicate entries, ghost beneficiaries and missing households were the first stumbling block that researchers from the Accountability Initiative of the Centre for Policy Research faced while tracking beneficiaries of the government’s sanitation interventions across 7,500 households in 10 districts and five states in a December 2015 study. Eventually, they studied 1,500 households that they could identify from the list. They found that a third of the households that government records showed as having achieved “sanitation status” actually had toilets, while 36% that had constructed toilets said these were unusable. Of the households with a latrine which had at least one member of the family defecating in the open, the most common reasons cited were absence of water and the pit being too small. Further, 40% of those who had applied for money from the government to build toilets reported not receiving it. As many as 3.1 million (88%) household toilets have been built in urban areas, against a target of 3.5 million for 2017-18, according to the Swachh Bharat Mission-Urban website. 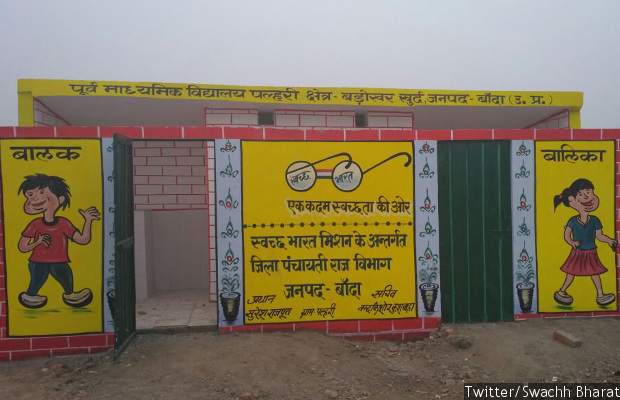 Also, 115,786 (56%) community toilets have been built against a target of 204,000. Yet, only 36.8% wards in urban areas reported a proper liquid-waste disposal system for community and public toilets, according to the 2016 Swachhta Status Report. The focus of Swachh Bharat Mission-Urban is slowly shifting from construction of toilets to solid waste management, the Accountability Initiative’s January 2017 analysis of the programme’s budget noted. Solid waste management includes segregating waste at source; collecting, transporting and storing waste; as well as processing, treating and finally disposing of it. In 2015-16, 25% of the total money released was for solid waste management and 70% for toilet construction; in 2016-17, 45% of the money released was for solid waste management and 45% for toilet construction. However, six states and union territories, including Gujarat, Assam and Kerala, are yet to receive any funds for solid waste management since the start of the programme, the study noted. For the 2016-17 financial year, 23 states and union territories were yet to receive any funds for solid waste management till January 18, 2017, the analysis noted. This is the second of a five-part series tracking the status of the BJP government’s promises three years after it was sworn in. You can read the first part here, the third part here, the fourth part here and the fifth part here.